NOTE: Neptune uses an exe setup file, and Windows (depending on the version you are running) might warn you that certain file types are dangerous to your computer and may advise against downloading and installing. Be assured that Neptune's products are fully compliant with window security and present no risk. This is a 14 day evaluation using a demo chart with restricted tidal data. On purchase when unlocked the full range of charts are available. Quick Instructions and the Manual are installed within the program from the Help Menu. System Requirements: Windows XP, Vista, 7, 8 and 10. The following terms and conditions apply to all use of this website and to any purchases of goods or services through this website. If you proceed with any purchase through the website, or on the basis of information on the website, you will be bound by these terms. 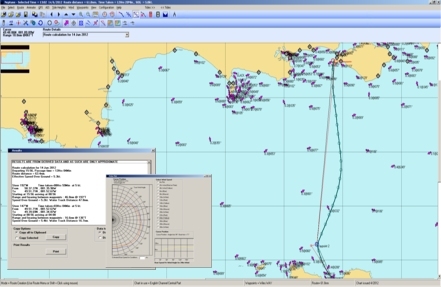 All material, including text, graphics and source code are the copyright of Neptune Navigation Software. Any unauthorised use of the materials on this site is strictly prohibited. Images are presented for illustrative purposes only, and may differ slightly from the actual product. It is expected that the purchaser of the product is familiar with the product and its application. It is the users responsibility to enquire before purchase if they have any doubt about the applicability of the products being purchased. If we are asked, and it is within the field of our experience, we will make our best endeavours to advise if a product is suitable for the intended application otherwise the purchase and the application is at your own risk. As is common practice with computer software, all rights to the program are retained by the developers and any "purchase" of software is the grant of a non-exclusive right to install and run the software on a particular machine, by the purchaser within the specific terms of that licence. Some software permit installation on more than one PC, but only for exclusive use by the same one individual for personal use, additional machines may require more licences. Licenses are not transferable without prior consultation by the original purchaser with Neptune. You may return a stock product, even if it has been correctly supplied in accordance with your order, within 7 days. If you have received hardware or media and that it is not in a damaged condition it will be replaced without charge. If you wish to return any product, other than as above, you must obtain the prior consent of Neptune Navigation. We shall use our best endeavours to provide uninterrupted access to this website. It is hosted at a commercial hosting company and occasionally may be subject to problems beyond our control. Inevitably there will be some periods of non-availability when maintenance or updates are required. We can give no guarantee of availability at any specific time, but outages should be rare. We hope to keep all information correct and updated at all times, but cannot be held liable for any errors: under no circumstances will we be liable for any costs beyond the refund of the purchase price paid to us. In the event of any dispute, you must make your complaint to Neptune Navigation in writing, to the address on the Contact page. If it is not possible to resolve the dispute by negotiation, the matter shall be determined under the laws of England and Wales.